Mighty Max toys were definitely some of the coolest toys of the '90s. I was way into them as a kid and still have all of my old sets from back in the day. I loved all the little details and features that were packed into the compact playsets, but most of all I loved the tiny figures that came with them. 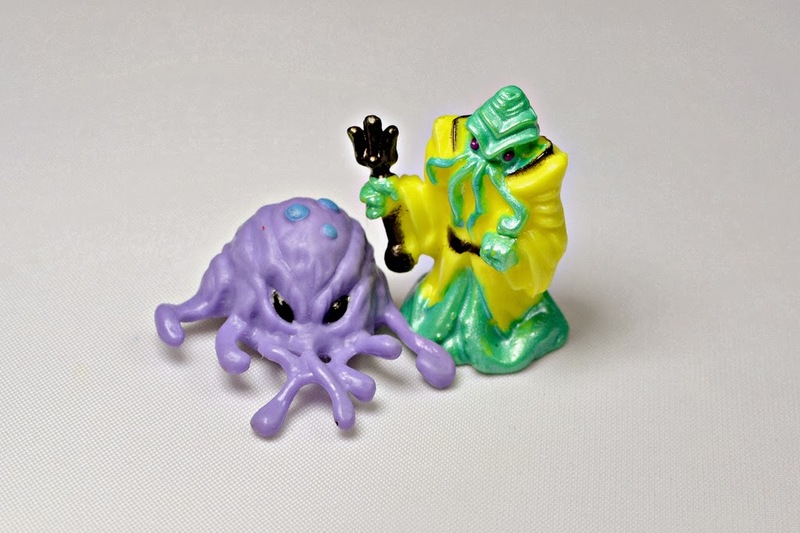 One set even had a little Cthulhu-esque monster! For anyone unfamiliar with the line, Mighty Max toys primarily consisted of "Doom Zones" and "Horror Heads," which were both forms of micro playsets, each with a theme or storyline that found the young hero Max facing various types of villains and monsters (for example, "Mighty Max Liquidates the Ice Alien" and "Mighty Max Challenges Lava Beast"). The Doom Zones were the larger of the two, often featuring moving pieces and other cool features. Basically, they were like Polly Pocket toys only marketed toward boys and 100 times cooler. 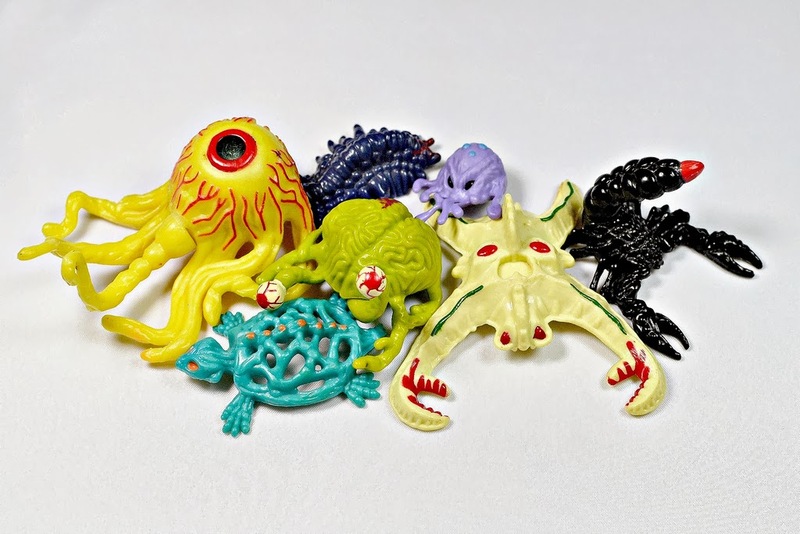 There were some pretty awesome little monster pieces that came with the sets, from a big tentacled eyeball to a brain monster to more standard types of baddies like a mummy, Frankenstein's monster and zombie. Above you can see a sampling of the micro figures from a bunch of the different sets. My most prized Mighty Max possession was probably the Skull Mountain, which was a huge (at least by Mighty Max standards) mountain playset that included multiple levels and lots of cool features and figures. I especially dig the little skeleton-turtle monster that came with it (shown in the top photo above). What do you think of Mighty Max toys? What are some of your favorite pieces? I'd say my favourites are Magus, the Dread Star, the Lizard and the Lava Beast Horror Head. Those are cool ones. I've always been partial to the Cyclops one. I think it might have been my first Mighty Max toy. My favourite part of the monsters is that they're actually part of the play-sets when folded up, (the larger ones, anyways). I never actually owned a single set brand-new, always from yard sales and such. My mom bought me the huge dragon head island one at a yard sale for a few bucks when I was a kid. Never had any of the parts, but it was still a cool play set for almost anything! That playset is so great. I remember getting it for Christmas as a kid. I hope I still have it in storage somewhere. Sadly all Mighty Max toys from my childhood have been lost and I have never seen any Mighty Max toys in second-hand stores. I'm tempted to search eBay now. Thanks for the cartoon link! I actually never watched it as a kid, which is weird because I was so into the toys. Yeah, definitely not easy toys to keep track of. I am sure I've lost some of the pieces! Hey Erikka, thanks for your comment. Yes, definitely an awesome toy line! I always assumed the same Max figures came in the same sets and were not randomized, but I'm not 100% sure. Hopefully someone else can confirm that. I'm wondering about the first series figures of Max being random myself. I'm so confident that my sets were never altered but when I compare the pictures of the early Max figures to others, I keep seeing different colored hats. Actually, I think I've seen different colored hats, on carded figures, at least on the Lava Beast Horror Head. I have an article about the Max figures over at MikesToybox.net which explains the randomization. Good to know most people are still fond of Max and Polly, and aren't stupid enough to let gender politics prevent appreciation, unlike the idiots over at Pop Rewind. Thanks, I will check out your article!